The internet whip market is really one of the freest markets there is today. People can freely buy and sell all over the planet. Every whipmaker is free to market his or her wares in whatever way they see fit and charge whatever price the market will bear. Thankfully, there’s no Federal or U.N. Whip Agency overseeing what we make or how we make it. In having such a free market, I think we have to police ourselves so others won’t have to. With that idea in mind, I want to touch on the topic of truth in advertising. For now, I’m withholding names to protect the guilty, but I’m hoping a few whip buyers will read this and be more alert. Better still, maybe the guilty sellers out there will read this and have a change of heart. I recently started keeping a small inventory of items on eBay. I hoped perhaps it would get me more established in a market I’ve not really taken advantage of over the years. To me, eBay is a real mixed bag when it comes to whips. Over the years I’ve seen hucksters succeed there, while a few really good whipmakers couldn’t seem to make a go of it. You’ve got some great stuff being sold right along side of rubbish, and unfortunately, lots of people can’t seem to tell the difference. There’s nothing at all wrong with “talking up a product.” In marketing, sellers are supposed to do that. No whipmaker in their right mind is going to advertise a whip with a line like “Eh, they’re okay. 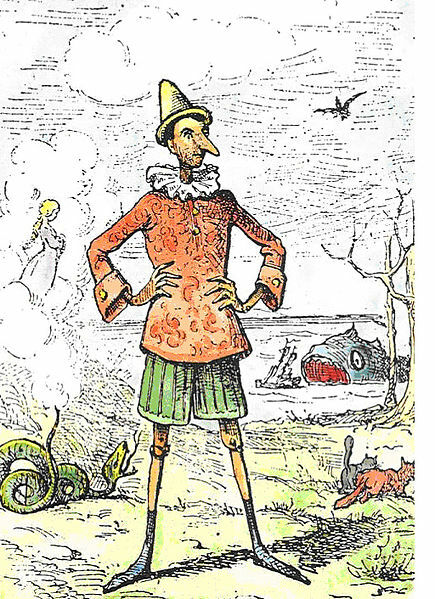 I guess.” I could nick-pick about claims I see about whips sounding like cannons, but I think (hope) most customers recognize such things as the hyperbole that they are. What I’m talking about are those who make claims that are plainly false in order to deceive unsuspecting customers. That’s what really irks me! So which is it? 22 years or less than 10?? 1991? or 2003-2004? I don’t expect someone to know the exact day they started a new hobby or craft, but there’s something fishy if they can’t decide which decade they started. Another inconsistency I’ve seen is great swelling claims of having made “[insert random number] thousand” of nylon whips on one listing and then another “[insert random number] thousand” of nylon whips on another listing. An unsuspecting customer may not think anything of this, but it sets off all sorts of warning flags for me. A while back I did some math with the claims I saw on one eBay listing. If I recall correctly, it came out that in order to support the claim, he had to be making something like 750 whips per year in order for it to be possible! That’s 2 whips per day. While I won’t say that’s totally impossible, I’d say it’s highly improbable. From other information I’m aware of, I’m almost certain our unscrupulous seller just picked a large, random number in order to fool people about his experience. The most prolific whipmaker I know of in the USA is Krist King. He has many retail outlets selling his nylon whips and they are literally everywhere. He tells me he produces an average of 12 or 13 whips per week, depending on what kind he’s making. I believe that claim because I’ve seen evidence of it over the years. With the particular eBay seller I have in mind, I’ve seen no evidence to support the outrageous claims that have been made. Personally, I see nothing to be gained from making boastful claims of having made “[insert random number] thousand” whips or something when I know it’s not true. I’d rather be known for quality instead of quantity anyway. I don’t understand why some people can’t just be real. What’s wrong with being honest about your experience and doing your best to make a good product? Why not be proud of what you’ve actually accomplished instead of trying to deceive people into thinking you’re something you’re not? In closing, I hope whip buyers will take time to evaluate some of the claims they see. Compare listings and see if the seller is being consistent in the stories he or she is telling. If a seller won’t put his real name on his product, that should be a red flag right there. If you see claims of thousands of whips having been made in a certain period of time, break out a calculator and see if the numbers look realistic. There’s far too many good sellers out there for you to be doing business with shysters. I’m very happy to introduce my newest line of nylon whips. It is the very affordable “FCE stockwhip.” FCE stands for “fast, cheap, and easy,” a name coined by my wife and I while out for lunch recently. The FCE was developed out of a desire to offer a simple, high quality, nylon whip at price low enough that even those on a very tight budget could afford it. 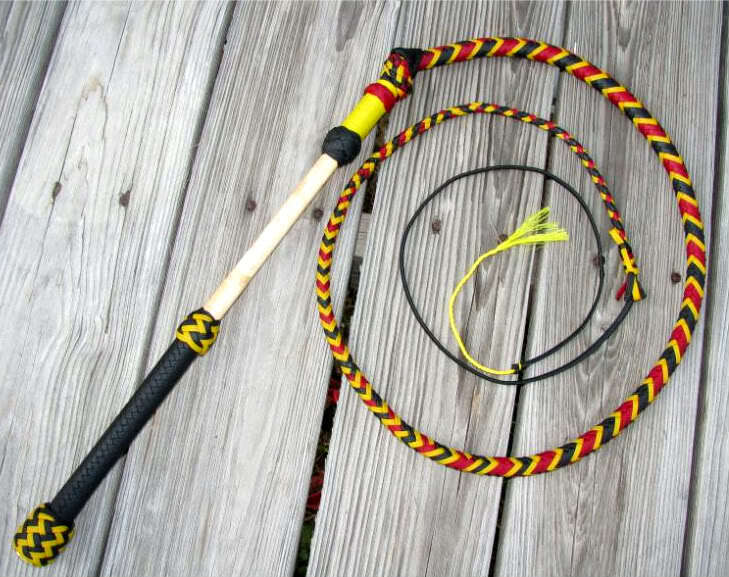 FAST: With its 4ft thong and 20″ fiberglass handle, these whips are fast. Not only that, the FCE whips are fast to make. By using a fiberglass handle with a non-slip rubber grip, it reduces the amount of time it takes for me to make the whip and enables me to get them out more quickly. CHEAP: At a base price of just $87.00, these whips are among the cheapest professionally made nylon stockwhips on the market. And although the FCE is priced cheap, it’s not cheaply made. Unlike a certain popular line of low priced whips from New Zealand, the thong of the FCE are handmade [by yours truly] to the same standards as my regular stockwhips -and cost less than the competition to boot. No machine woven nylon rope here! EASY: Easy to crack, easy to make! These little whips really crack nicely. 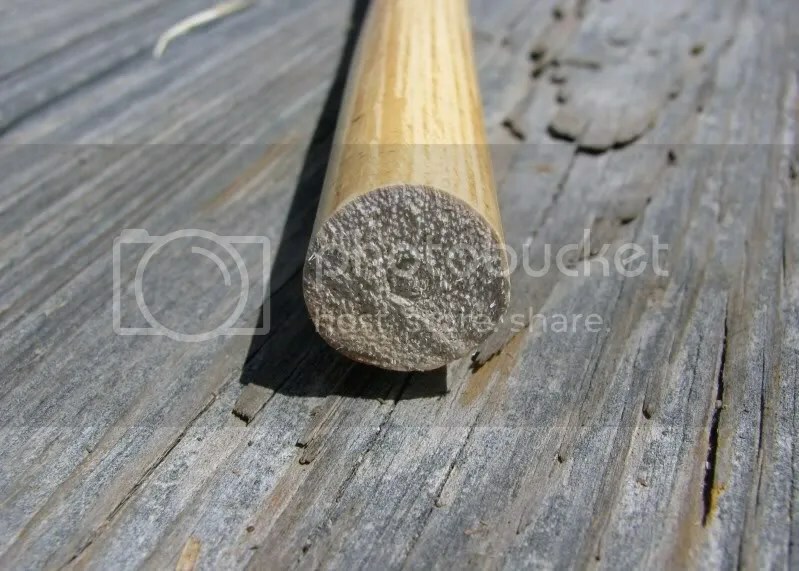 It takes little effort to get a very nice crack out of them. 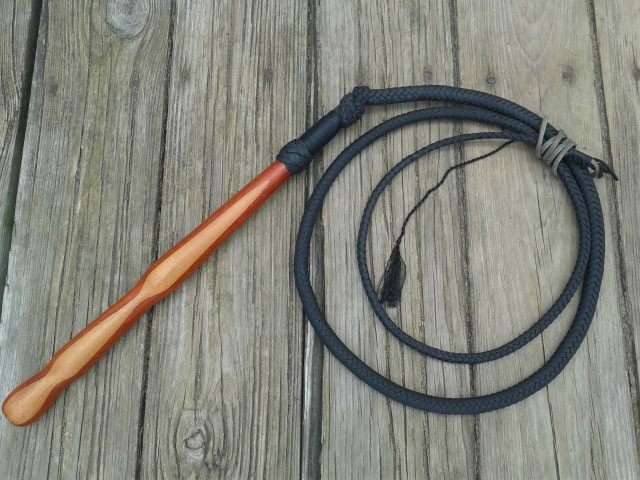 With the 2 major customization options being the handle colors and the length, the whips are easier for me to make than some of my other more customized whip designs. The basic $87.00 FCE whip is 4ft long with choice of handle and the keeper and thong in solid black. The main option for customizing the FCE is handle color. Handles are available in orange, blue, purple, pink, and green. Add $10/ft for thongs longer than 4ft. Other customizations will be handled on an individual basis with prices to be determined during the ordering process. To order, visit my contact page. Do you want to learn to crack whips like a pro? Buy the Whip Basics DVD series and let whip coach Robby Amper show you how! I have just lowered the price of the Whip Basics 3 disc compilation to $45.00 with shipping included to U.S. addresses! For more information or to order your set, please email me at Rhettswhips @ Yahoo . com. Click here to see video clips from the series!